Our Elf on the Shelf Marty brought us an early Christmas gift from Santa! He included a sweet and thoughtful message to our girls reminding them to always remember the reason for the season. Santa wanted you to have this early Christmas gift. He wants you to always remember the reason for the season. We celebrate Christmas because it is when Heavenly Father sent his son Jesus to the earth. Santa hopes you enjoy learning about and playing with this nativity as you prepare to celebrate Christ's birth this Christmas. Santa knows you love Jesus very much and that you are trying to be like Jesus. The Christmas season is a great reminder to be more Christ-like. Remember to be kind, generous, and grateful. Listen to your parents and do nice things for those around you. Above all love one another. Enjoy this season of giving and sharing love with your family. 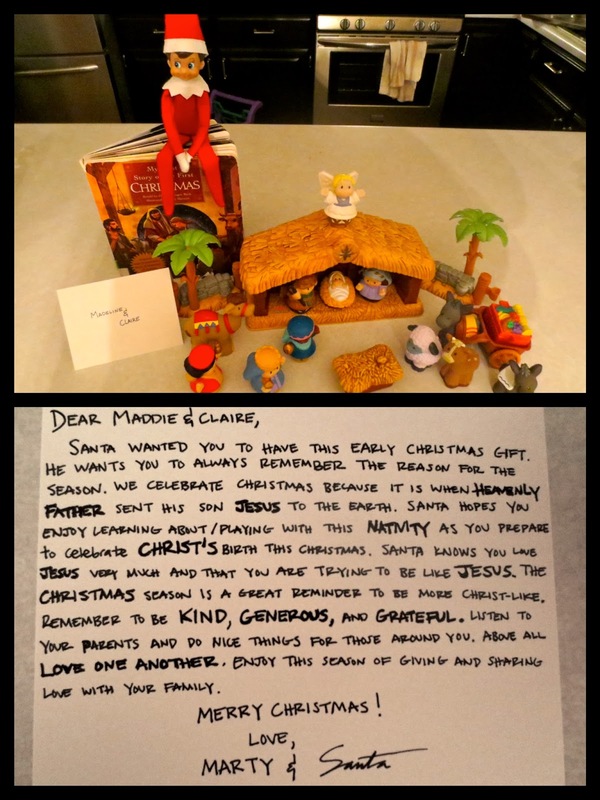 Elf on shelf religious idea with nativity and note from Santa about true meaning of Christmas. Christ centered Christmas.